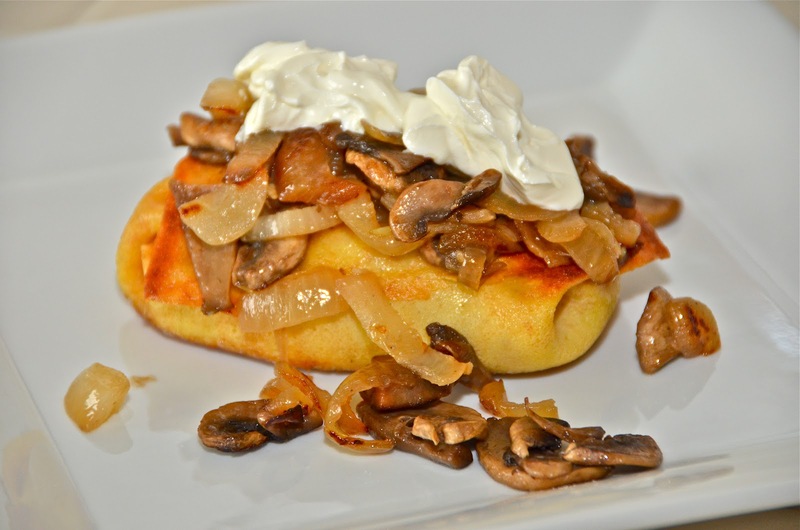 Crepe stuffed with Creamy Chicken and topped with Mushrooms and onions. Using a hand mixer or stand mixer combine milk,water,eggs,sugar,salt,and oil.Gradually add flours. Scrape the sides with spatula if needed and mix well. Refrigerate for at least one hour or overnight. extra light olive oil or any other oil. Shredded cheese Monterrey jack,mozzarella, or both. Heat a frying pan with a little oil. Add the mushrooms and cook until its no water is left and they start to fry. continue to cook them for 2 minutes. Take them out. Add about 3 tablespoons oil to the same pan and Add the onions. Saute the onions until soft with a nice golden color.Add the mushrooms(fried) to the onions.Add garlic and spinach (optional) and season with salt and pepper. Cook for another minute. 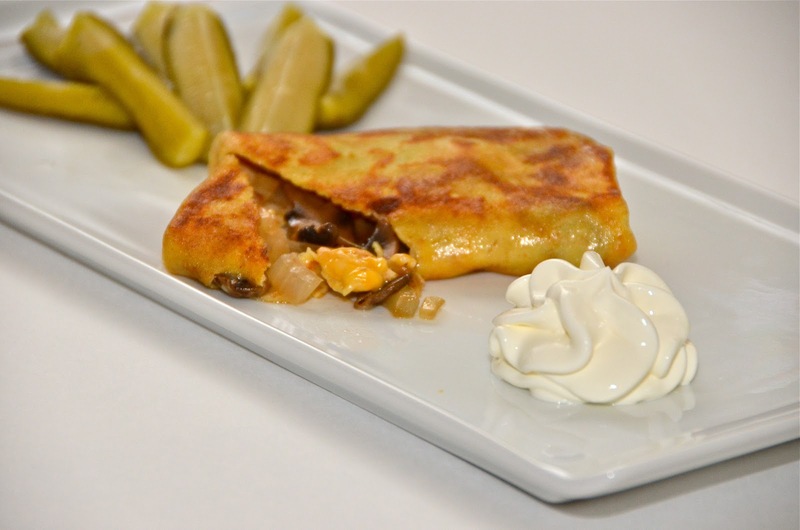 Place about 1-2 tablespoons of the mushroom filling and cheese on the bottom edge of the crepe. Fold it into an envelope. Repeat with the rest of the crepes. Heat a small frying pan on low heat .Melt about 2-3 tablespoons butter. Place the folded crepe and fry on low heat until golden in color. Serve with sour cream and dill pickles (optional). Melt the butter in a frying/saute pan on med-high heat.Add onions and garlic. Cook 30 seconds and add chicken.Cook it for 3 minutes mixing often.Add Cream cheese and cream.Mix well until cream cheese is melted for about 4-5 minutes.Season with salt and fresh ground pepper. 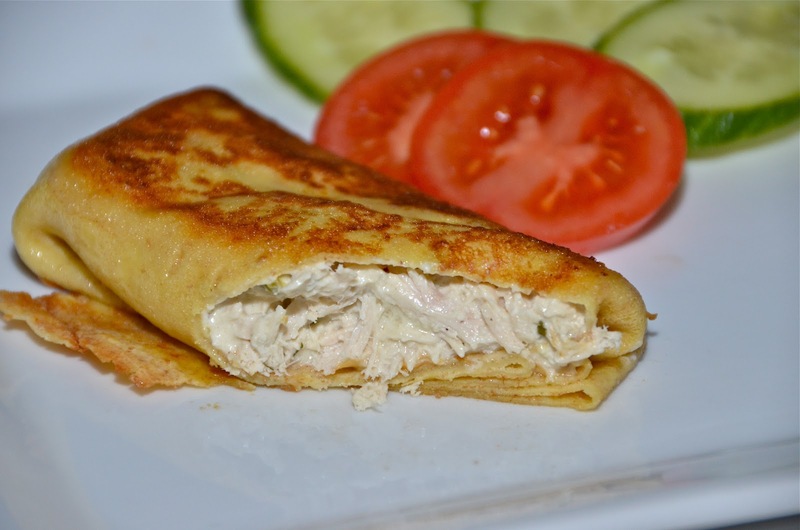 Place about 1-2 tablespoons of the chicken filling on the bottom edge of the crepe. Fold it into an envelope. Repeat with the rest of the crepes. Heat a small frying pan on low heat .Melt about 2-3 tablespoons butter. Place the folded crepe and fry on low heat until golden in color. I looove crepes. These look fantastic! Nadia, I just found your blog. Savory crepes are something I really love too – especially with chicken – and mushrooms! Perfect! We share a love for Jesus. Hope you will come visit my blog too. We had a lunch at church today for our youth missionaries and they served these:) very delish!!! I will definately give it a try soon. Take care!!! Thank you Jennifer for stopping by.I'm heading over place right away…Blessings to you! Thank you Mary for your comment.I'm glad you liked it. I will be happy to see you back.God Bless you too! Thanks Inna! I know, It's hard to say no to these, my weakness too.Take care! Thank you Marina.Yes, I love them.try it,hope you like it.God bless! I made both with mushroom and cheese & Chicken for Christmas few months ago for breakfast brunch! Let me tell you, these were a big hit! This was a new dish I introduced to my American family and they LOVED it and asked me to for more orders. It did take me some time to make this, but it sure is worth all the time making these. I also made some in advance and refrigerated it since they do take time to make. Loved both of the recipes.